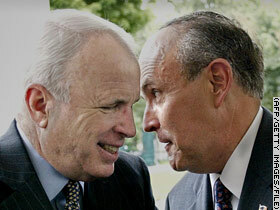 WASHINGTON (CNN) -- Sen. John McCain has slashed Rudy Giuliani's double-digit lead by 10 points, but the GOP picture gets muddier if former Sen. Fred Thompson or former House Speaker Newt Gingrich enters the race, according to a CNN poll gauging the popularity of 2008 presidential hopefuls. Giuliani, the former New York mayor, had a healthy 16-point lead over the Arizona senator last month, but that has dwindled to six points -- that is, if either Thompson or Gingrich enters the race. Should they both toss their hats in the ring, Giuliani's lead over McCain drops to three points, 27 percent to 24 percent. Analysts say McCain may have been buoyed by an April 11 speech at the Virginia Military Institute, in which he declared full support for President Bush's plan to send additional troops to Iraq. Giuliani may have taken a hit in the polls as questions continue to arise about his stances on abortion, gay rights and gun rights. The CNN poll was conducted Tuesday through Thursday by Opinion Research Corp. Pollsters quizzed 1,218 registered voters, including 498 who call themselves Democrats or Democratic-leaning independents and 368 Republicans or Republican-leaning independents. The Democratic survey has a sampling error of 4 percentage points; the GOP survey's sampling error is 5 percentage points. The poll shows that voters would give substantial support to Thompson or Gingrich if they decided to enter. Thompson, a former senator from Tennessee who has played a district attorney on three episodes of NBC's "Law & Order," would snare 11 percent of the vote (12 percent if Gingrich decides not to enter) if he announced a 2008 presidential bid. Gingrich, on the other hand, would take 8 percent of the vote (10 percent without Thompson in the race) if he entered the running. Former Massachusetts Gov. Mitt Romney, who led Republican hopefuls in first-quarter fundraising with $23 million, slid into the No. 4 spot -- between Thompson and Gingrich -- with 10 percent of the vote. Nine GOP candidates placed behind Gingrich and each earned 2 percent or less of the vote. Thirteen percent of Republicans polled said they were unsure who they would vote for. Clinton still tops among DemsOn the Democratic side of the ticket, Sen. Barack Obama has slashed Sen. Hillary Clinton's lead to single digits, according to the poll, but not because support for the former first lady is waning. The New York senator still earns 36 percent of the vote, compared to 37 percent in a poll last month, but Obama, the freshman senator from Illinois, saw his support jump from 22 percent last month to 28 percent this month. The poll suggests a generational divide may be emerging in the Democratic race, according to CNN Senior Political Analyst Bill Schneider. "Clinton's lead comes from blacks, older Democrats and those who did not go to college -- traditional Democrats," Schneider said. Obama's supporters, however, are more likely to want to change the direction of the Democratic Party, Schneider said. "Obama does best among younger, college educated Democrats -- those who distrust the establishment," Schneider said. Bringing up the rear is former North Carolina senator and vice presidential candidate John Edwards, who earned 15 percent of the vote. New Mexico Gov. Bill Richardson and retired Gen. Wesley Clark each earned three percent of the vote, while the remaining four hopefuls failed to snare more than 1 percent of the vote. Seven percent of Democrats polled said they were unsure who they would vote for. However, just like with Republicans, the inclusion of a well-known politico in the race could make the Democratic picture murkier. If former Vice President Al Gore enters the race -- although he has said repeatedly that he has no plans to -- support for Clinton, Obama and Edwards drops. Obama and Edwards would see marginal drops in support, but Clinton would see her support decline from 36 percent to 30 percent, according to the poll. Gore, the 2000 Democratic nominee who won the popular vote but fell short in Electoral College votes, would draw 15 percent of the ballots if he entered the race, the poll states. "The name 'Clinton' remains a powerful draw among African-Americans," Schneider said. Obama's share of the black vote has grown since last month, but last week's poll showed that 88 percent of blacks felt Clinton understood the problems they face, while only 77 percent said the same of Obama. Those questions had a sampling error of 6 percentage points.